Today we released a new version of FX Draw which includes a new way of accessing Help – the “How Do I Create?” box. If you have something that you want to create but do not know how to do it, type it in here. 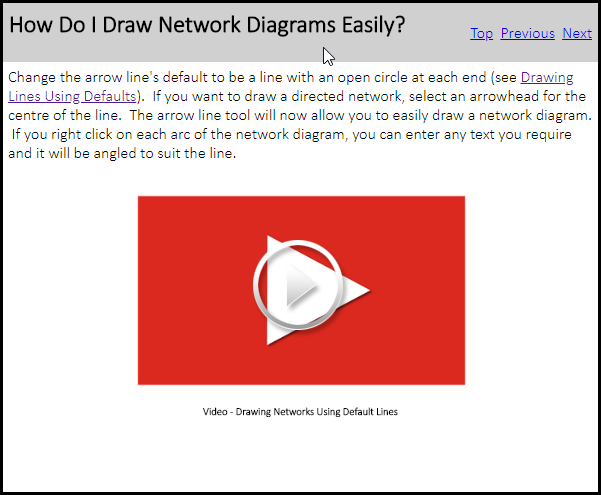 For example, you might type in “Network Diagrams”. When you press Enter, your browser will do a Google search on our Help documentation. The top result looks like this. If you visit the page, you will see the other major change we have implemented, we have linked all of our training videos directly into our Help system. If you click on the video you get training that is immediately useful to you. The “How Do I Create?” box will appear on all of the products as we release new versions.